Does your kitchen need a refresh? Are you ordering in pizza to avoid a kitchen that doesn’t quite inspire you to great culinary heights? Do you have a list stuck to the fridge via magnet listing all the special instructions that broken appliances require to (sort of) work? It may be time for a remodel. Home remodeling may seem like a daunting task, but quality remodeling contractors can guide you through the process. Let’s take a look at seven key steps you can take to bring your vision to fruition. Imagine. Pick up some interior design magazines and get inspired. Think about both style and function. How do you want the space to look? What kind of meal-planning capacity do you need? Do you entertain in your home frequently? Prioritize. Once you have a clearer idea of what you want and need, think about which aspects are Must Haves and which are Nice To Haves. You may find that concepts that look great in a magazine won’t work with your home’s interior design, or your family’s needs. Knowing these factors will help you make decisions down the road. Budget. Set a benchmark range for what level of budget you’d like to invest in your kitchen. You may have a hard ceiling on this number, or more of a rough idea. Either way, having a clearer idea of the budget you have in mind will help you with decision-making and provide a good start to conversations with your kitchen remodelers. Schedule. Sketch out a timeline for when you’d like to begin and finish your remodel. The home remodeling space is predicted to grow by 2% per year through 2025. You may need to get a jump start on your project to ensure your remodel is finished when you need it to be. Contract. 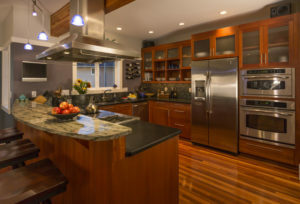 It’s time to select a remodeling contractor to renovate your kitchen. Communicate your needs, vision, budget, and schedule to the contractor. This will help ensure that everyone is on the same page from the outset and allow the process to go smoothly. Construct. Prepare to live without your kitchen facilities while your new kitchen is being constructed. Your remodeling contractor should help you prepare a temporary kitchen during construction to minimize the disruption to daily life. Cheers! When your project is complete, be sure to raise a glass with friends and family to celebrate your beautiful, functional new kitchen.